firstsnow_2005, originally uploaded by Petite Pie. Last night I took a break from studying to watch Me and You and Everyone We Know, which was kind of irritating, except for the parts with the kids and the pooping back and forth forever. Even though her particular brand of quirkiness made me squirm, I took a look at Miranda July's site because I think she does what she does in good faith. Spent a long time digging into her interactive web project, Learning to Love You More and remembered how much more rewarding this site was during its brief participatory moment. If I asked you to submit assignments to the Pie blog, would you do it? Probably I have to earn some readers back first. 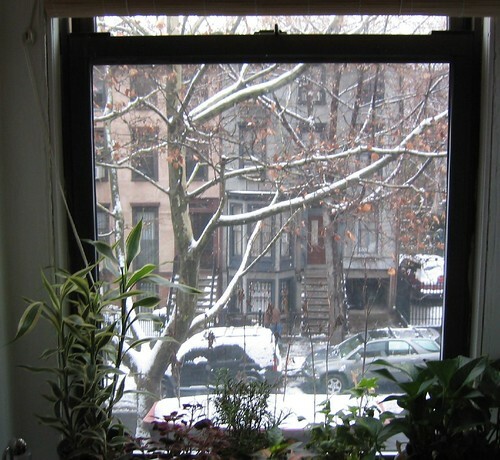 Anyway, we woke up to SNOW this morning in Brooklyn, but I haven't touched any of it yet. What is the weather like outside your window? Will you describe it in the comments below, or even send me a photo at hideousprog (at) yahoo (dot) com for me to post right here on the site? You don't have to win me back as reader: even though I don't comment very often I keep reading to know what you and C are up to. Ready to participate in anything you want. As for the picture by my window, you would only get a facing wall. So much for the weather. I'll take a camera out with me tomorrow and see what I can do. Or you could check my blog, there's a picture update from a webcam at the top of the sidebar on the right. urban landscape, parking lot, baseball field. I watched you, me and everybody recently too and it made me feel weird too! Like I couldn't look my own self in the eye but couldn't articulate why. I do agree though that the pooping back and forth thing was so hilarious that it still brings a smile to my face. Actually, I think its the commentary on how connected and close we are in terms of proximity and technology but how very far apart we are in our day to day realities that made me most queasy. Well, you can't lose me, as much as you might like to! Um, and that would be she who was affectionately known as the Spinster!